First off, happy birthday to Rockets general manager Bruce Hamilton. Hamilton was born June 30, 1957. That makes him 53 today. Not much has been made of it, but the Rockets home opener this season is starting about a week later than last season. The reason? It likely had to do with the lack of marquee players that were made available to the WHL when the season started as NHL teams were in no rush to send them back to their junior teams. In Tyler Myers case, they kept him for an entire 82 games. I was interested to see where Luke Moffatt would end up at the NHL draft. The fact that he was selected in the 7th and final round came as a bit of a surprise. Would he have fared better in the draft had he played with the Rockets this past season? I can guarantee you he would have been put into every crucial station on a Rockets team that was re-tooling following a WHL championship season a year earlier. I can understand why Moffatt didn't want to play in Kelowna as a 16 year-old, especially with a stacked team where he would have played second fiddle. But in his draft year, as a 17 year-old rookie, he could have been one of the leaders of the band, much like Shane McColgan. Now NHL scouts have touted McColgan as a possible first round pick in the 2011 draft. You have to applaud Kootenay Ice GM Jeff Chynoweth for taking a firm stance by elected not to draft a player at the CHL import draft. Chynoweth wasn't willing to bring in a European born player for the sake of filling an import spot. The gm obviously feels he has enough depth with his North American kids not to make a selection for the sake of making a selection. Why bring in a European born player that is costing you a ton of money when a North American kid can provide you with the same skill level? Or why not bring in a young prospect that you can develop within your team so he can be a major contributor when he's 18 and 19? Good thinking on Chynoweth's behalf. What's the future of former Kelowna Rockets forward Stepan Novotny? Novotny was anticipating returning to the Swift Current Broncos as a 20-year-old this season, but the Broncos made two selections in the import draft. If they can get both kids to come to North America, is Novotny's (who fills two spots as an overager and euro) WHL career over? Talk about not using a valuable resource. The Prince George Citizen newspaper has arguably one of the top junior hockey writers in Western Canada and what is he doing? He sure isn't writing articles and covering the Cougars and the Western Hockey League like he used too. Jim Swanson is doing behind the scenes work these days, and frankly its a shame. When a local newspaper like the Prince George Citizen doesn't realize the valuable asset they've got and don't use it appropriately, they get what they deserve. Who's going to be the new play-by-play caller for the Vancouver Giants? Morley Scott vacated the spot to become the play-by-play voice of the Edmonton Eskimos. Obviously filling that position is extremely low on the Giants priority list. It may come on the list below purchasing new water bottles for the 2010-2011 season. I suggested that it would be neat to see the Rockets organization celebrate their 20th season in the WHL this year by bring back the logo used by the Tacoma Rockets in the first four years of their existence. I wouldn't want to see that logo on the front of the jersey, but wouldn't it be cool if a shoulder patch with the retro logo was part of the new jersey? A special person in my life is pretty pleased that Taylor Hall was selected first overall in last Friday's NHL draft. My niece Taylor, who lives in Kelowna, is a huge fan of the newest member of the Edmonton Oilers. Why? Because her name too is Taylor Hall. In fact at the 2009 Memorial Cup I asked Taylor Hall if he could say hi to my niece back in Kelowna. Being the class act Hall is, he said in an interview, "Hi this is Taylor Hall of the Windsor Spitfires and I want to say a special hello to Taylor Hall in Kelowna". Small potatoes right? Not in the eyes of a eleven year-old grade five student. I made contact with Tyler Matheson last week. The 20 year-old tells me he is playing lacrosse this summer and is trimming down. It was nice to hear from the personable Matheson, who doesn't take for granted the opportunity he has been given to play at the major junior level. 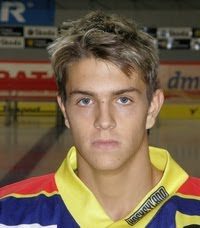 The Kelowna Rockets have selected Slovenian native Gal Koren with its second pick in the 2010 Canadian Hockey League import draft. A 6-foot-1 191 pound centre/left wing, Koren had 41 points in 32 games for Jungadler Mannheim playing in Germany last season. He has also played for the Slovenian Under-20, Under-18 and Under-17 national teams and was rated 69th on the international skaters ranking for the 2010 NHL draft. The selection of Koren marks the second centre the Rockets selected in the import draft after choosing Andreas Stene of Norway earlier in the day and marks the end of the import draft for Kelowna. The Kelowna Rockets have chosen a Norwegian forward at the CHL's Import Draft. 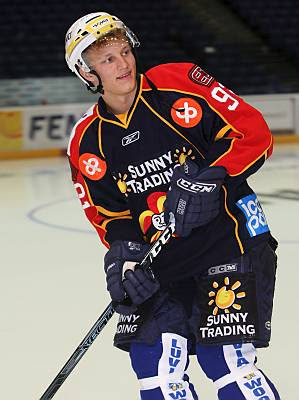 They selected 19 year old Andreas Stene with the 25th pick in today's draft. 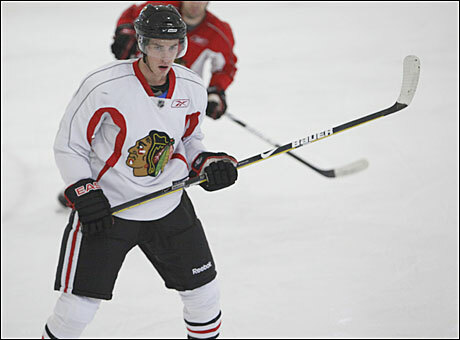 Stene tried out with the Chicago Blackhawks last year. The 6'3, two-hundred pound Stene is expected to play with the Rockets this season. Rolling the dice at the Canadian Hockey League European draft table has worked out awfully well for the Kelowna Rockets over the years. Last summer's 50th pick appears to be no exception. Now that the Detroit Red Wings have selected Temmu Pulkkinen,you would think the Wings would be interested in having the prospect play on North American soil. That would mean Pulkkinen would be wearing a Rockets jersey. So if Pulkkinen fills one European spot, who fills the other? The Rockets have the 25th overall pick in Tuesday's CHL euro draft. Exactly 90 days and away we go again! 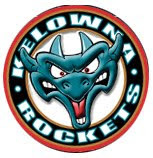 The Kelowna Rockets announced the date for their home opener to kick-off the 2010-2011 season. The Rockets open the campaign at home September 25th against the Prince George Cougars. That home opener against the Cougars will be the Rockets 20th in the Western Hockey League (four in Tacoma and 16 in Kelowna). Is it time to introduce the 20th anniversary jersey with the old Tacoma Rockets logo incorporated into the new look? The Rockets will play six exhibition games, including two each against Vancouver, Kamloops and Chilliwack. Home games are set for September 4th, 11th and 18th. Brett Bulmer is a second round pick (39th overall) of the Minnesota Wild. Coming into the draft Bulmer was projected to be a late 3rd rounder at best, but the Wild obviously like what they see from the Prince George resident. I am pleasantly surprised at the early selection. The last time a Rockets player was picked in the second round was in 2004 when Blake Comeau was selected by the Islanders, 47th overall. Technically Bulmer was picked higher than Comeau (2004) and Shea Weber (2003). Weber was a second round pick of Nashville, 49th overall. What makes this pick so impressive is Bulmer was selected before highly touted Seattle goaltender Calvin Pickard. The Edmonton Oilers picked Kelowna resident Curtis Hamilton 9 spots later. Brett Bulmer says he will be spending a lot of time in front of the computer Saturday morning. This may not sound unusual for your average teenager, but the Kelowna Rockets forward will be logged onto NHL dot com and refreshing the page continuously until he see's his name and the team that drafted him. Bulmer will be tracking the NHL draft in Los Angeles, California from his home computer in Prince George. "Obviously its going to be a big stage in my career being drafted into the NHL, so I'm excited for it". Who's more excited about him being drafted? His parents or the soft spoken 17 year-old? "I'm pretty excited but I know they are equally excited because they have been there through all of it with me, so it's for them too. Bulmer attended the NHL Combine earlier this summer and was interviewed by 21 teams. NHL Central Scouting projects Bulmer could be drafted anywhere from the 3rd to the 6th round.The first round of the draft goes Friday with rounds two through eight on Saturday. The father of Kelowna Rockets goaltender Adam Brown is looking for work. Newell Brown's contract as an assistant coach with the NHL's Anaheim Ducks was not renewed. Brown is being replaced by Mike Foligno. Newell Brown won a Stanley Cup with the Ducks in 2007. Brown has spent the past seven year as an assistant coach in Anaheim. 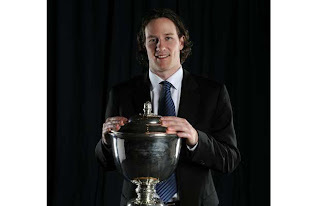 Duncan Keith's whirlwind season has ended with him winning the Norris Trophy as the NHL's top defenceman. The Chicago Blackhawks blue-liner beat Washington's Mike Green and Drew Doughty of the Los Angeles Kings in voting conducted by the Professional Hockey Writers' Association. Keith's year included an Olympic gold medal, Stanley Cup and the Norris Trophy. He registered career highs in goals (14), assists (55) and points (69) and posted a plus-21 rating. Tyler Myers is the NHL rookie of the year. The Buffalo Sabres defenseman picked up the award at Wednesday's annual NHL awards in Las Vegas. Myers played in all 82 games with the Sabres this season. Myers was also named to the NHL's all rookie team. The 20 year-old was the Kelowna Rockets first round pick in the 2005 WHL bantam draft. 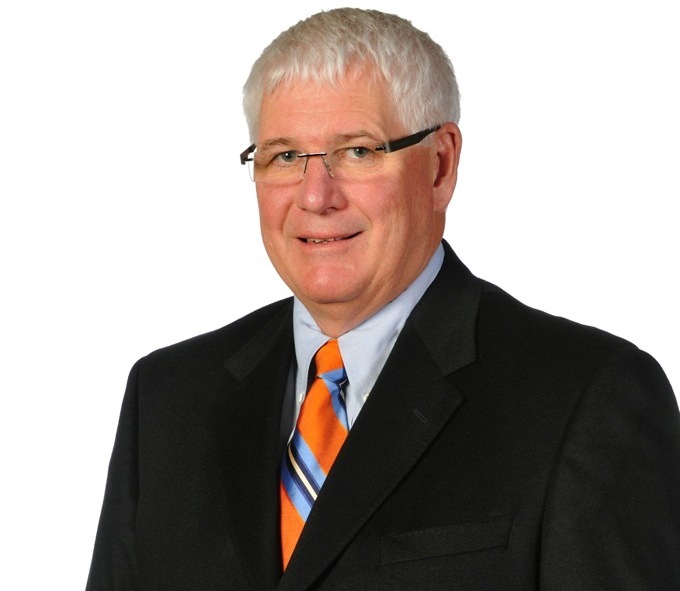 Kelowna Rockets general manager Bruce Hamilton has been re-elected as the Chairman of the Board for the Western Hockey League. Hamilton will hold the post for another two years. What this essentially means is Hamilton will be busy representing the WHL at Canadian Hockey League meetings involving the QMJHL and OHL representatives as well as other matters which directly impact the Western Hockey League. Hamilton was re-elected after voting at the league's annual meetings today in Calgary. Kelowna Rockets defenceman Tyson Barrie is one of 41 players invited to take part in Team Canada's summer evaluation camp for the upcoming world junior hockey championships. Barrie is also one of 18 Western Hockey League players taking part in the camp in St. John Newfoundland in August. Barrie isn't the only Kelowna connection to the summer camp. 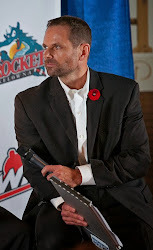 Rockets head coach Ryan Huska is an assistant coach on Team Canada. 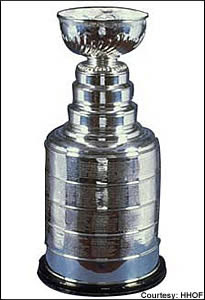 The Stanley Cup is no stranger to the Okanagan. Ken Holland brought it back to Vernon when he was the general manager of the 2008 Stanley Cup champion Detroit Red Wings. Now Chicago Blackhawks defenseman Duncan Keith is going to be bringing the Stanley Cup back to the Okanagan, specifically Penticton, his home town. Keith stated Wednesday night on Hockey Night in Canada that the cup is coming to Penticton sometime this summer. Traditionally ever player of the Stanley Cup championship team is rewarded with no less than one day with hockey's 'holy grail'. When will Keith share the Stanley Cup with the city he grew up in? Keith is a Stanley Cup champion. Congratulations to Chicago Blackhawks defenseman Duncan Keith for winning the Stanley Cup. Keith and the Hawks used overtime in a game six victory Wednesday night. 2010 will go down as a memorable one for the pride of Penticton. Keith won a gold medal for Canada at the Olympics, has a Stanley Cup championship and has a good shot of taking home the hardware later this month as the NHL's best defenseman. As Keith said on Hockey Night in Canada following the Stanley up victory, he is indeed bringing the cup back to the Okanagan, specifically to his hometown of Penticton. It marks the third time in Rockets history that a former alumni has won hockey's holy grail. Travis Moen (Anaheim) and Scott Parker (Colorado) also have Stanley Cup rings. They clashed as coaches at the 2009 Memorial Cup, now they will both help Canada win gold at the upcoming World Junior Hockey Championships. Kelowna Rockets coach Ryan Huska and Windsor Spitfires bench boss Bob Boughner were named assistant coaches to Team Canada head coach Dave Cameron. Huska and Boughner clashed as coaches when Boughner's Spitfires beat Huska's Rockets 4-1 in the 2009 Memorial Cup in Rimouski, Quebec. Huska admits its ironic the two are now members of the same coaching staff. "I guess I could say to him that he probably could have shared the wealth a little bit. He knew he was going to have a good team this year (laugh), so he could have helped us out last year. It's a chance to work with some very good coaches at this level." It's the fourth time in Kelowna Rockets franchise history that a member of the coaching staff will participate at the World Juniors. Marcel Comeau, Marc Habscheid and Jeff Truitt have also represented the Rockets at the tournament. 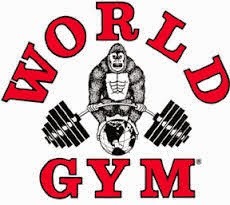 This years event is in Buffalo, New York. The Kelowna Rockets hockey club has set a goal of raising 200 thousand dollars for the orthopedic unit at Kelowna General Hospital over the next five years. The funds will be raised through the Rockets alumni weekend which takes place each summer and includes a golf tournament and hockey game. In the past the alumni weekend has raised 109 thousand dollars for K-G-H-'s pediatric and maternity ward. This years alumni weekend takes place July 22nd to the 25th. Kelowna Rockets head coach Ryan Huska spent Monday interviewing for a coaching position with Canada's world junior team. If Huska is awarded one of the three coveted spots, he would join Marcel Comeau, Marc Habscheid and Jeff Truitt as former Rockets coaches that have been a member of Team Canada. This years tourney is in Buffalo NY. The Kelowna Chiefs are now official. Rockets GM Bruce Hamilton has given approval to the KIJHL franchise to play out of the Rutland Arena next season. The most interesting development in Hamilton's agreement with the Chiefs is his ability to terminate the franchise on January 1st of each year if he doesn't like how its operating. FYI: Geordie Wudrick did not sign a contract with the LA Kings and is now a free agent. Troy Mick is leaving his post as the head coach and general manager of the Revelstoke Grizzlies. Mick has taken a job as the director of hockey operations and player development with Pursuit of Excellence Hockey Academy in Kelowna. Mick will remain a part owner of the Grizzlies. Mick led the Grizzlies to the KIJHL and BC Championships along with the Cyclone Taylor and Keystone Cups.